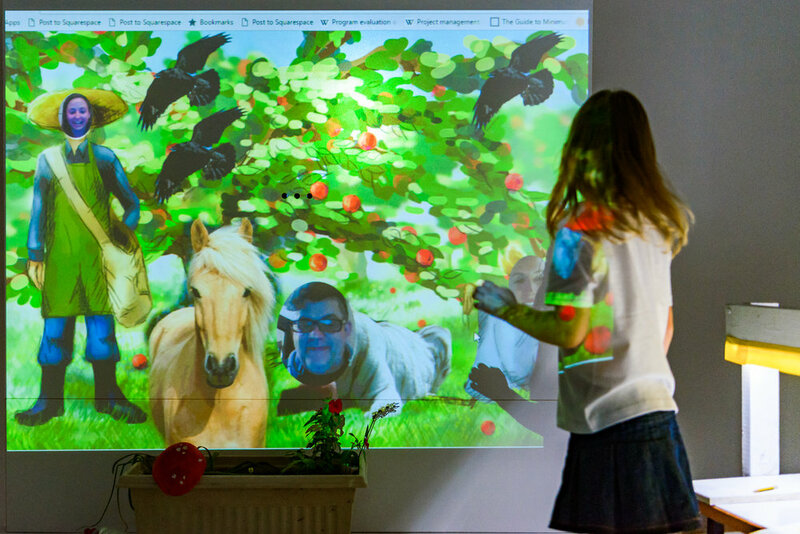 We demonstrate in this slideshow how the Magic Garden platform works to increase creativity. We began with the life cycle of apples. The children learned to ask good questions and directed their role plays. The benefits and test results are shown at the bottom of the page. 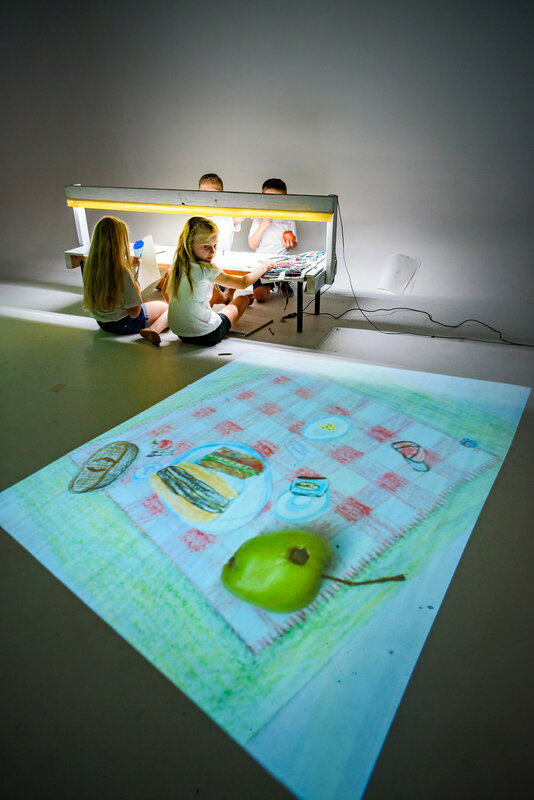 Saskia burst out loud “Wow, it’s real!” as we sat down on a digitally projected picnic blanket to enjoy eating home grown apples. Krister cut the apples to reveal the seeds as we explored where apples come from. We explored being part of a world and caring for it. Lisa and Saskia picked the red apples from their new apple tree. Magnus wondered why he couldn’t pick the smaller greener ones. Mats reasoned that like ourselves and animals, maybe the tree had its own agenda and was not ready to give up some its unripe apples. She then disrupted the idea of what a caterpillar is by becoming one. The digitally projected costume of a caterpillar followed her around the room as she ate everything in sight. Then everyone wanted to gain empathy for what it was like to be, think and feel like a caterpillar. In that instant, they blurred the boundaries of being a caterpillar in its environment and humans in their home. We wondered, “What is a home anyway?” and Lisa giggled over Saskia’s interest in how caterpillars eat all their living rooms out. To make the dilemma real, we invited Magnus’ father to call in from work to role play being the caterpillar in the apple tree. He was verrrry hungry and reluctant to give up his apple house! Magnus had the brilliant idea of feeding his hungry caterpillar father with real apples as a trade for giving him the apple house. Concerned the tree would be left bare without apples, we returned to wonder who else needed apples. Saskia invited her mother to appear as an apple farmer. It was a natural choice: parents are their children’s first and most influential educators. Like many mothers we interviewed, she also missed both seeing Saskia and role playing in her imaginative stories. 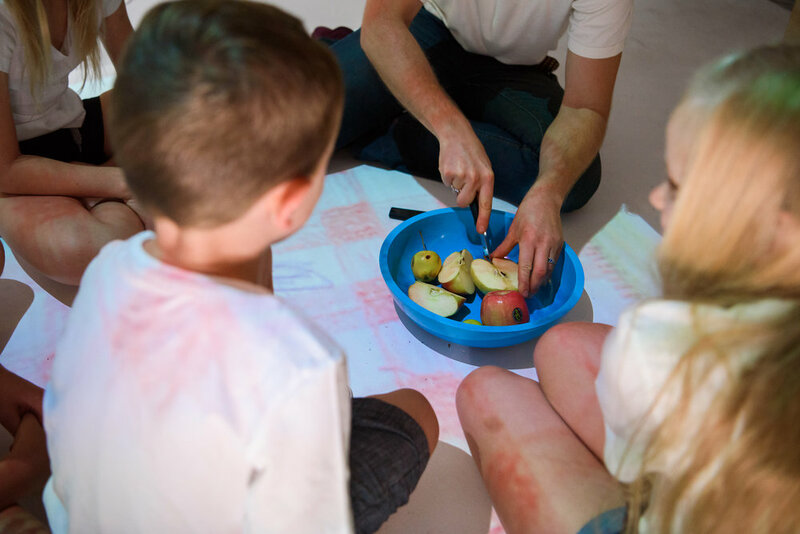 To problem solve their way out of the ethical dilemma of sharing, the children experimented creating new scenes and inviting their parents to role play new characters. When Saskia explored baking with apples, we invited former White House Executive Chef, Marti Mongiello from another time zone and continent to nurture her special talent in recipe-making (in the form of a Siberian Tiger). The incursion was an instant hit. It expanded children’s source of inspiration by merging not just cultural influences in food but also machine, human and animal. Magnus revelled in his newfound creative control after discovering that the picnic blanket was in fact hand drawn on a piece of paper. Lisa’s theory emerged that we are made of so many things from the food we eat right down to our tiny bacteria. I agreed that it’s an inseparable mix that forms who we are. Sketches and found objects... the possibilities for creating a live scene are limitless. The children watch the scene take shape live as they build it together. Lisa drew her own decorative medal. Mats gives Magnus his own medal. Magnus felt so awesome he wanted two medals. It seemed only fitting to wear, “one for moral bravery and one for creativity”. Saskia jumped with joy sporting the medal she had drawn. Her medal followed her between rooms into the next adventure. Mat's own hand drawn medal! Behind the scenes: the control tower is where I launched the show. 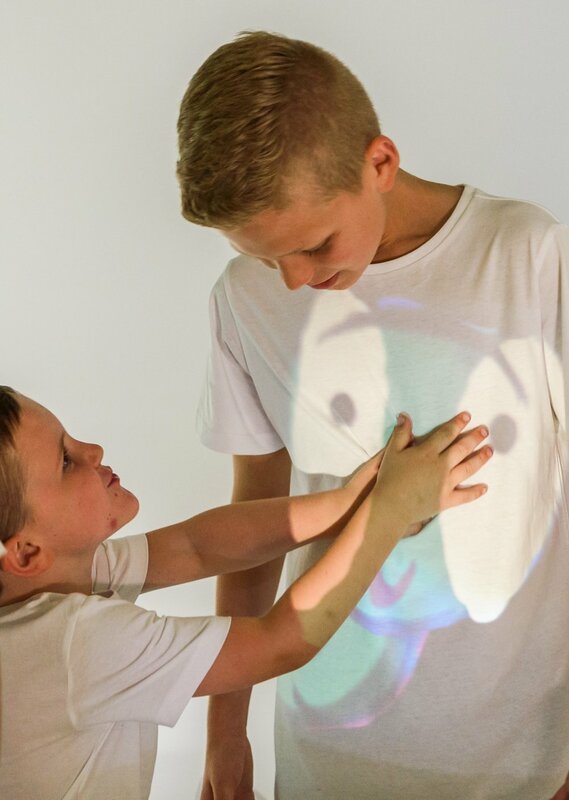 On stage: our interactive theatre is so easy to use any child and educator can use it. It adapts to your preferred method for learning and teaching. 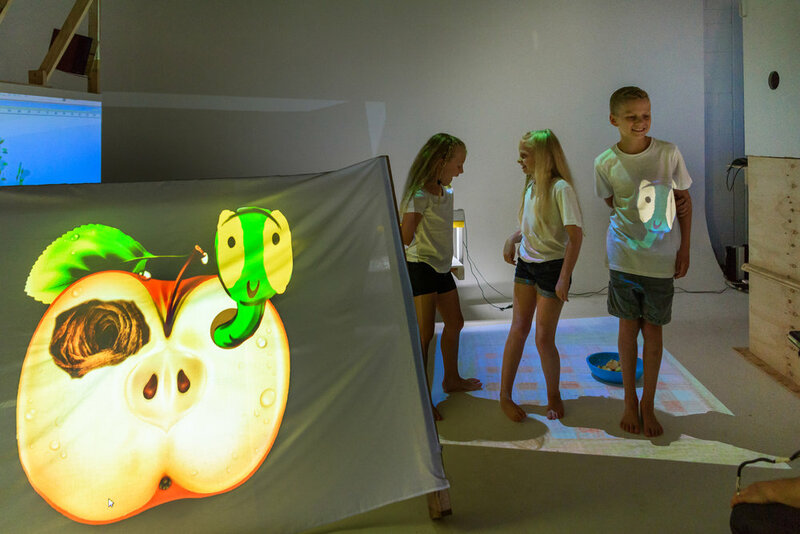 Using Children's Philosophy in tandem with the our interactive theatre amplifies the creative and learning potential of both children and educators. 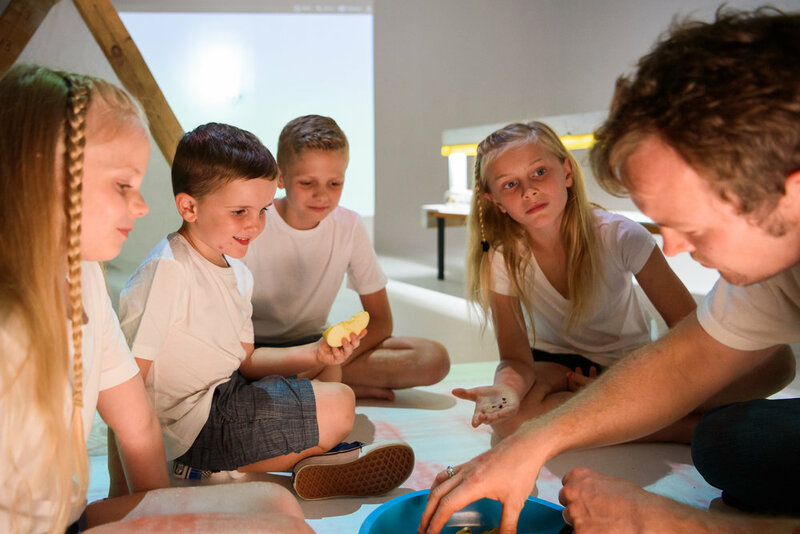 Our interactive theatres adapt in real time to children's natural way of learning through role playing and educator's preferred method of applying their creative curriculum. Children’s core driver and dream is to realise and experience their imaginative worlds in a physical form. We empower them to create their worlds and pursue their dream inside them. There is no need for a technical manual. You step into the space and it adapts to your wishes and creative work in real time. 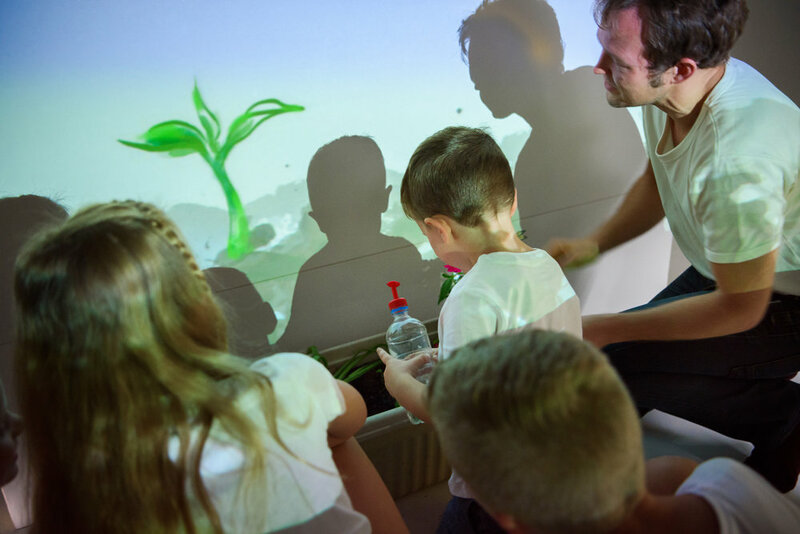 Our Magic Garden subconsciously triggers children and adults to quickly slip into a natural state of roleplaying in an unlimited range of environments that they previously had no access to. Both roleplaying and our curriculum are among the most effective methods in learning because as a human species we have evolved to learn through to play and pursuing our curiosities. Children drive the questioning and collaborative reasoning while educators apply their wisdom in the moment to draw out the learning potential of themes. Parents who miss seeing their children are able to role play with them as their first and most influential educators and talent-mentors. Children gain the foundations of reworlding the planet (giving it a new future) by becoming morally brave explorers that learn by coexisting with nature and appreciating how much of it still remains undiscovered. 3 year-olds experience 3-9 times longer calm-focus. The maturity of 4 and 5 year-olds increases to that of a 7 year old by triggering their philosophical thinking and being. We consider doing philosophy with children to be the height of their potential creativity. Children use their whole bodies in multi-sensory learning which increases memory retention. It is also inclusive of children who are disadvantaged by today’s vision-based learning and have great strengths in learning through other senses including kinetic learning for example.